"This design developed while I was exploring the artistic possibilities of logarithmic spirals. Spirals have been fascinating humankind for most of recorded history. The Archimedean spiral - a spiral that maintains the same distance between each line after every rotation (imagine a tightly coiled fiddlehead) was named after the Greek mathematician Archimedes, one of the earliest people to formally study the spiral in the third century B.C., but it wasn't until the sixteenth century that Rene Descartes became one of the first people to write about the logarithmic spiral: a spiral which widens as it circles outward. This type of fractal spiral - which is much more complex mathematically - is actually much more common in nature: snail shells, hurricanes, certain flower petals, draining water, and the tails of certain animals (such as the seahorse), all spiral following a logarithmic pattern. After experimenting with the spiral, I decided to use the opportunity to create a seahorse - an animal not found in the Pacific Northwest (and thus not found in traditional Coast Salish art). I adjusted some of the designing techniques from my more traditional art to create the head and body - then attached it to the logarithmic spiral to create the tail. In the end, I had a design that combined some of my favourite elements of Coast Salish design with the elegant beauty of geometric balance." 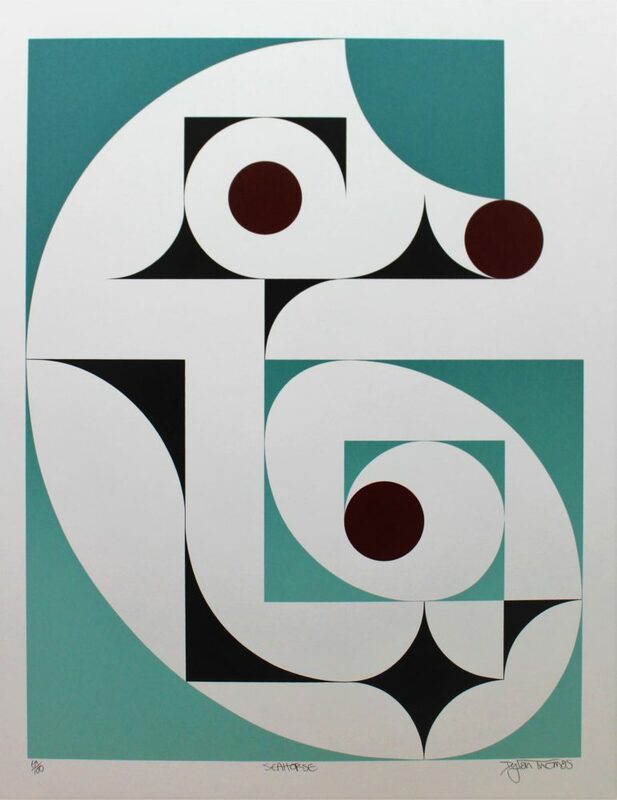 This limited edition silkscreen print titled "Seahorse" by Dylan Thomas was hand produced by the screen printing process. It is the only limited edition printing of this design. The artist has inspected and signed each copy in the edition. All trial copies of this edition have been destroyed and the printing stencils obliterated.